Joel Schmidt sat bedside while his father rested in a hospital bed, recovering from a horrific fall off a ladder. At the time, the Little Rock, Arkansas resident was unsure if his then-74-year-old father would make it. Schmidt was reminded of decades earlier, when his father would rush into his room in the early morning, prying him out of bed to have breakfast and get a move on to go fishing. Schmidt said that to this day, the activity "never gets old." They would rush out to their local lake by sunrise, fishing rods in hand, patiently waiting for their next catch. As Schmidt sat beside his ailing father, he joked about his father's burial to lighten the mood. That's when the idea for Schmidt's creation came about -- caskets that appear to be miniature fishing boats. 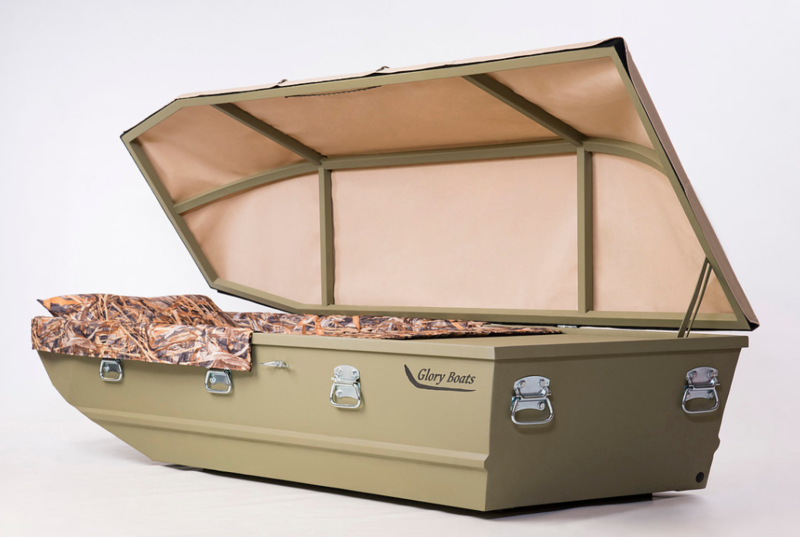 His company, Glory Boats, makes customized caskets for those who love the outdoors and reeling in some fish. Their slogan, "Celebrating the lives of outdoorsmen," captures this very message. The boats, listed at $2,800, come in three different colors: Woodland camo, marsh grass and pink camo. Schmidt explained that he wished he had the idea of the pink camo before his mother died several years ago. She was an avid lover of the outdoors, just like him and his father, he said. He described her as a tomboy who loved to fish and hunt, and thinks the pink camo model would have been a wonderful resting place for her. Now, Schmidt and his team go to various outdoor shows, promoting their sentimental product. Many have approached him about other outdoor-based designs, such as deer stands and duck models. Schmidt, however, believes there is a generational issue with the caskets. The oldest person to purchase a Glory Boat was 77, he said. Most of their sales come from people under age 60. Older generations, like that of his father, prefer to be buried in a more traditional, formal casket, he added. "Older generations are reluctant to break with tradition," he said. In fact, Schmidt's father was one of those very people, mentioning he preferred a traditional blue steel casket to be laid to rest in. That decision won't have to come for some time, Schmidt said, as his father recovered from his fall and is still alive today. Glory Boats, which will celebrate its one-year birthday in August, is a local company through and through. Joel is in partnership with his brother-in-law and son-in-law. Their job is to weld the boats using metal from a local door company they partnered with. Then, the welded frame is sent to another local company to finish the job. Summer months are the company's busiest by far, and when he isn't working on the boats, Schmidt is a professional photographer. In fact, he has been in the photography business for nearly 25 years, doing a lot of work with local schools. Although the Glory Boats company is rather small right now, it is receiving inquiries from people across the United States, Schmidt said. "People like to fish and hunt in all kinds of places, not just the south."